Our experience, the modern car fleet as well as the safety of our transfers, guarantee your excellent service through Santorini Airport Taxi and your direct and comfortable transfer. Our Santorini Airport Taxi service guarantee your convenience, comfort, and safe transfer to and from any destination within the Santorini island. With our private transfer service, there are no long taxi lines or crowded buses to worry about. 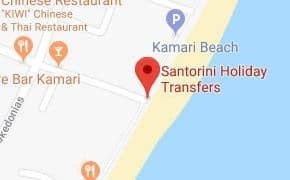 Our vehicle is only for you and can transfer you upon your arrival with shuttle bus or Santorini Airport taxi from Santorini airport to Fira, Santorini airport taxi to Imerovigli, taxi from Santorini Airport to Oia and any other location in Santorini. Of course, we provide Santorini taxi to airport transfers from any Santorini destination. Santorini Airport (JTR), also known as Thira Airport, is located on the eastern side of the island, near the village of Kamari. It is the largest airport in the southern Aegean Sea and also operates as a military airport. Its apron area is relatively small, the airport can only serve 6 civil airplanes at a time. Santorini International Airport (JTR) started its operation in 1972. In December 2015, the privatization of Santorini International Airport (Thira) and 13 other regional airports in Greece with the signing of the agreement between the Fraport AG / Copelouzos Group and the Greek Government. The aim of privatization is to develop the airport’s infrastructure so that it can serve the increasing tourist flow to the island, reorganizing the airport apron area as well as the modernization of its facilities to improving the overall customer travel experience. The plan of upgrade works in Santorini Airport will start in 2018. Santorini Airport’s (JTR) tower (118.05) also serves as an approach/departure to FL170. Make your reservation for airport transfer through our site for Santorini Airport (JTR) Taxi, Van or Minivan. The transfer was easy to schedule and the drivers were very professional! This company is top notch!